Most of the time a fever in children is not serious and is simply because of one of the many infections children get when young. It is rare, however, for a baby under three months of age to have a fever so you should talk to your doctor right away if that happens. No matter the age of your child, he will need a lot of fluids, but won’t always need medicine. You should, however, check for signs of dehydration or other problems. Read on to learn how to reduce fever in your child and when you should seek medical help. What Causes Fever in Children? The most common cause of fever in children is an infection from a virus. Viral infections can lead to diarrhea, flu, coughs, or colds and in some cases even more serious illnesses. Infections caused by bacteria will affect children less frequently but may still be the cause of a fever. It is more likely for bacteria to lead to a serious illness like meningitis, septicemia, kidney or urine infections or even pneumonia. Some infants, particularly newborns, will develop a fever if they are in a warm environment or overdressed. At this age, they still can’t completely regulate their body temperatures. Some babies and children will develop a low-grade fever following a vaccination. It is possible for teething to slightly increase your baby’s body temperature but it will rarely raise it over 100 degrees Fahrenheit (37.8 Celsius). If your child is uncomfortable or fussy, you can give him ibuprofen or acetaminophen. Never give aspirin and always be careful to follow the correct dosage. Ask your doctor how much to give if your child is under 2 years old or has medical problems. You shouldn’t give a baby under two months medication without talking to your doctor. Change your child’s clothing to lightweight ones and use a light blanket or sheet to cover him. If you overdress or bundle him, it can lead to an increase in temperature as the body heat can’t escape. Check the temperature of your child’s bedroom and make sure it not too warm or too cold. Offer your child fluids like water, ice pops, soup, and gelatin to help him stay hydrated. Sometimes when your child has diarrhea or is vomiting, his doctor will recommend giving him an electrolyte solution for children. Never give sports drinks as the sugar can worsen the diarrhea. Let your kid eat whatever he wants but don’t force feeding him. Although your child doesn’t need to spend all day in bed, make sure he gets enough rest. 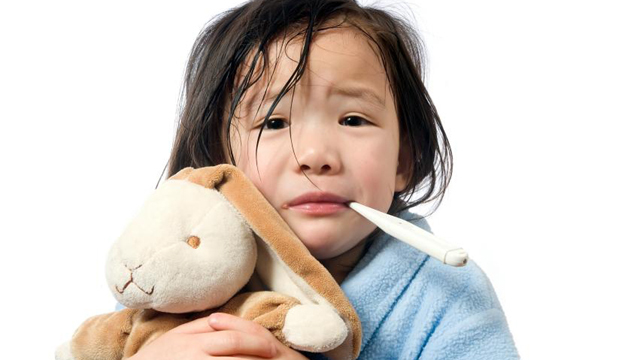 When your child has a fever, keep him out of childcare or school until his temperature is normal for a full day. Sometimes a gentle air flow can be fine, but the room has to be the right temperature. If the air is cool, it will do more harm than good. Instead, just try opening the window. Some parents will lower fever via a lukewarm sponge bath, but this hasn’t been supported by evidence and can sometimes make your child uncomfortable. You should never use alcohol, cold baths, or ice packs. When Is Fever in Children Serious? Whether or not the fever is serious enough to call the doctor depends mostly on your child’s age and the temperature. Today doctors will look at not only your child’s fever, but also his overall condition. Most of the time your child won’t need medication if he has a fever less than 102 degrees Fahrenheit (38.9 Celsius). The only exception is if your infant is under three months old and their rectal temperature is over 100.4 Fahrenheit (38 Celsius) in which case he needs immediate medical attention. In young infants, even a small fever may indicate a serious infection. If your child is older than three months but younger than three years, then talk to your doctor if he develops a fever above 102.2 Fahrenheit (39 Celsius). When your child is older than this, you can simply pay attention to his activity level and behavior.